I teach music in an elementary school. Several years ago, my handbell choir and my mallet band were invited to perform at a local theater, part of benefit concert concert for a local charity. (Insert shameless brag here: you ought to see my 10 year olds play handbells – it’s impressive! And my mallets – wow, they are really good!) Lots of local groups came to perform. We were really excited to participate, and we also also excited to be allowed to stay and watch the entire concert! One of my students sat next to me during the concert. He had a charming habit that I always remember: he would sit on the edge of his seat, so excited, with his hands raised to chest level and ready to go. At first, I didn’t understand his stance (can’t he just sit still, relax, stay awhile? ), but my little friend quickly explained: “Mrs. Spivey, I like to start the clap! I want to be the first one to start clapping, and the whole audience will follow me!” It still makes me smile today, years later. My student was quick to celebrate the success of others – what an incredible trait to learn so young! It’s a great example and lesson for us! For my student, the concert was that: a concert. It wasn’t a competition. He was excited to be there and share his talents, and it didn’t take anything away from him at all that others were invited to share theirs as well. His joy wasn’t diminished – in fact, it was the total opposite: he wanted to “start the clap”! He immediately had his servants prepare a party – he said to bring the best robe quickly and gave them a list of things to prepare for a celebration (Luke 15:22-24). He “started the clap”! The prodigal’s brother had a much different response. He was upset at his father’s joy, and somehow got the idea that a celebration of his brother took something away from him. His father had to explain, “Son, you are always with me, and all that is mine is yours. It was fitting to celebrate and be glad” (Luke 15:31b-32a). Important to notice: the prodigal’s return didn’t take a single thing away from the brother – nothing was reallocated, nothing was lost. Actually, something was added: his brother, back in his life! This was cause to celebrate, but the brother couldn’t because he made it all about himself. Maybe you know someone who has adopted this attitude, centered around self. 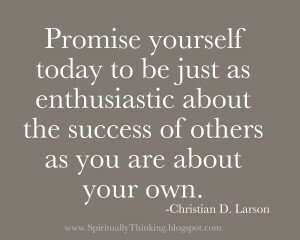 Maybe you have been someone who has adopted this attitude, centered around self. A friend gets a raise, gets a contract, gets an inheritance, gets a new car…. what’s the first thing that comes to mind? Do you think, “Why them and not me?” or do you “start the clap”? My student didn’t think that sharing the stage was taking anything away from us. His joy wasn’t diminished because he wasn’t the only one invited. He was happy to be there with everyone. He did his best on stage, played an important part and did well with his group. He then joined the audience and led them in “starting the clap”! His joy was genuine and contagious. He was ready to start the celebration! I love that! If a 10 year old can do it, we can do it too! The ability to value the gifts of others without allowing a root of jealousy to form – that’s a treasure. Romans 12:15 says to “rejoice with those who rejoice, and weep with those who weep”. Oddly enough, sometimes the weeping part is easier than the rejoicing part. I’m praying that you will find that, in this life, there is enough joy to go around. I’m praying that you will be able to recognize that the blessings of God in someone else’s life do not take away or diminish yours at all. You might know Bea already – she’s a regular on my facebook and instagram 🙂 No pretense: I never intended to love a dog, but I sure love this one! 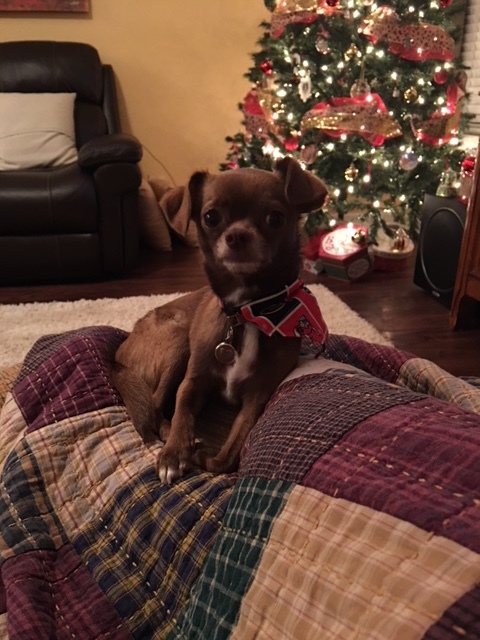 Bea does lots of funny things – she has a BIG personality packed into her little 5-pound body. One of her habits is the way she greets us after we have been gone for a while: she has to have something in her mouth before she can come to us. I don’t know why – as soon as we walk in the door and release her from her crate, she runs to find a bone or a toy before she lets us pick her up and love on her. As she likes to hide her bones all over, she can’t always find one quick enough for a greeting – in that case, she’ll get a mouthful of dog food from her bowl and them come running for us. I sometimes kind of wonder if she is bringing a little offering of sorts. When the babies came home for Christmas break, I noticed something: I was constantly finding pieces of dog food under their bedroom doors, just as far as Bea could poke it under there. 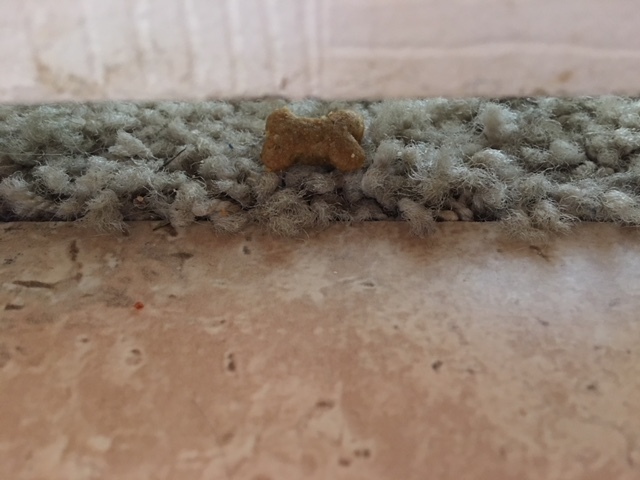 I know its hard to tell what you are looking at here: that’s the hallway tile on bottom, the bedroom carpet in the middle with the piece of dog food, and that’s the bottom of the closed door on top. I get up WAY earlier than anybody in the house (even Bea), and I leave my bedroom door open so she can come find me when she wakes up. I wonder if she is trying to visit the babies when she wakes up, taking a gift to see if they’ll let her in. It’s completely silly to try to imagine what she is thinking and utterly ridiculous to attach a response or emotion to her actions (she’s a dog for crying out loud), but I do it anyway! If I’m allowed to attach an emotion/reason for her action (just for the sake of this silly story! ), maybe its because she recognizes that it’s because of us she has a home and toys and bones and all she needs. She wants to give something back. My heart is touched by her offering and I’m excited to see her too. I don’t feel impatient as she looks for her bone – I smile and wait for her. Give me a little grace on the Exodus one, okay? It’s not exactly the intended context, but sometimes when I think of this verse, I think about all that God has done for us, all His generosity, all the things that I can think of, and all the things I can’t think of because He is so big and so far beyond my comprehension. To come before Him with nothing seems ungrateful somehow – He has done so much, how can I offer a response of utter emptiness? If all I have is a praise or a word of gratefulness, that’s still something. When the Lord draws me into His presence, I want my first response to be praise – I want to bring Him a gift. Like little miss Bea scrambles for a bone or some sort of offering, let’s do the same for our Heavenly Father, as He is the Source of everything we need. At every opportunity, thank Him. Father, thank you for breath! Thank You for health! Thank You for air conditioning! (that’s not silly – I really am grateful for AC!) Thank You for provision! Thank You for guiding my children! Thank You for friendships! Thank You for every good and perfect gift! Thank You for mercies, new every day! Nothing is too small to mention, nothing too insignificant. God is our Source of all – it’s right for us to recognize Him as such. I believe God’s heart is touched by our offerings of gratitude and He loves us so. He doesn’t feel impatient as we search for words – I imagine he smiles and waits. I know that there are hard days, difficult times when we might not feel grateful – that’s just a feeling. Push on through it and be grateful anyway! Being quick with gratitude or praise every day, that’s a treasure! Praying you have lots to be grateful for today – take a moment to thank God!